In Trinidad and Tobago, expats will find churches, temples and mosques existing beside each other. Each culture contributes to the islands’ identity and environment, and festivals are joint celebrations. Regardless of their origins, the people of Trinidad and Tobago and hospitable by nature and welcoming to visitors. Celebrations and festivals take place throughout the year. The small island of Trinidad is a melting pot of cultural traditions and hence is always bustling with cultural activity. Trinidad is known for the musical instrument called the steelpan, which was created in the 1930s in the Port of Spain. It is also famous for calypso. 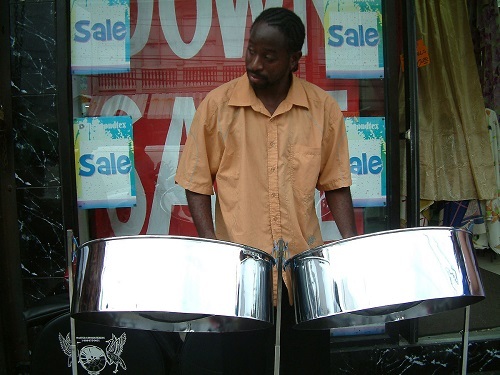 Steelpan artists perform at competitions, festivals and other events throughout the year. Indigenous music of the island such as calypso, soca and steelpan can increasingly be heard around carnival time. There are also numerous artists who make what can be termed ‘world music’ but with uniquely Trini roots. Expats can head to the local bars and pubs to hear local fusion bands as well as Indian-Creole fusion. Trinidad also has rock, reggae, jazz, pop and R&B musicians, in addition to indie music and local chutney music, which is an indigenous form of music. The island is also home to western and eastern classical music traditions and it is common to find performances by choral groups or university groups, often performing with steel bands. Full-scale musical theatre and operas also take place. Trinidad is a great place for budding musicians as it offers a platform to showcase their music. Venues such as the Jean Pierre Complex in the Port of Spain hosts gospel concerts. Around Christmas time, Parang music, which has Hispanic American origins, can be heard. There are plenty of theatrical companies operating in Trinidad and performances vary from elaborate song and dance musicals to solo performances. Expats are likely to find at least one play going on over the weekends. Theatre groups usually put up local versions of metropolitan comedies, in addition to some original work. The university departments feature productions of popular local and foreign musicals. When in Trinidad, don’t forget to catch performances by the Centre for Creative and Festival Arts at the University of the West Indies, St. Augustine, which showcase local and regional classics and plays about local history. Some of the popular venues where plays are held include the CLR James Auditorium, Queen’s Hall in Port of Spain, Little Carib Theatre and Naparima Bowl in San Fernando. Trinidad even has a Best Village competition annually, which involves a number of local playwrights and actors. Before the festival of Diwali, the Hindu tradition of Ramleela is staged. Trinidad has a thriving dance scene that varies from regional folk dance to styles from across the world. There are shows throughout the year by dance schools and companies. You will find more experimental productions from smaller dance troupes, while the bigger companies feature yearly seasons, mainly at Queen’s Hall. The Best Village competition showcases folk dance from the local communities and many groups visit as guests from across the country. If it’s art that interests you, then the seven galleries of the National Museum house is the place to go, as it features some of the best artwork in the country. There are plenty of other galleries too that feature new work. Local art is on display at the Museum for most of the year. 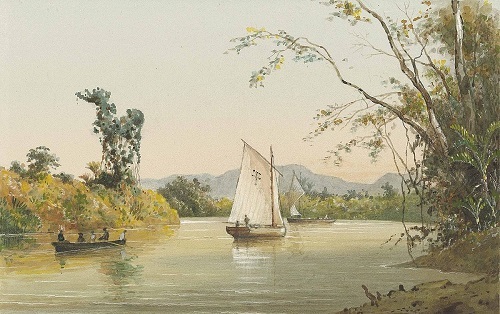 It also showcases a collection of watercolors by Michel Jean Cazabon, the country’s leading 19th century painter. There is a yearly show put on by the Art Society, which includes drawings, sculpture and paintings. Expats who dabble into a bit of art themselves can take advantage of the plein-air art painting sessions held in various scenic locations. There are art exhibitions happening all year round, especially during the period between Easter and Christmas. Many of these take place at the established galleries, while there are some that even take place at an artist’s home or at a restaurant. Some of the popular galleries in Trinidad include Medulla, Studio 66, 101 Art Gallery and Horizons. Some of the best-known writers across the generations have come from Trinidad. They include Lloyd Best, Earl Lovelace, CLR James, Michael Anthony, Nobel Laureates VS Naipaul, Elizabeth Nunez and former Prime Minister Eric Williams. A local writer who has recently published a book that became internationally successful is Monique Roffey, whose novel ‘White Woman on a Green Bicycle’ was on the shortlist for the Orange Prize in 2010 and won the Bocas Prize in 2013. The book was launched in the Port of Spain. Expats can head to places like the National Library, the University of Trinidad and Tobago, the National Museum and local bookstores for readings, book launches and lectures. The film industry in Trinidad and Tobago is growing and many filmmakers from the island are producing and featuring their work internationally. The Trinidad and Tobago Film Festival, a two-week yearly event, takes place in September and October and screens local and international films. The festival also runs workshops and community screenings. Expats can also visit the European Film Festival that screens some of the best film releases from Europe. If you are in the mood for more commercial entertainment, visit any of the many cinemas in the island. A few of the older venues still offer the double-feature, which allows you to watch two films on one ticket. Trinidad has three multiplex cinemas and an Imax Cinema in the Port of Spain. Trinidad and Tobago Fashion Week features leading local designers. There are also other fashion showcases taking place usually at the end of the year. Local jewelry made from seeds and shells is on sale at the Hotel Normandie. Tobago has a rich festival scene that includes folk traditions that have deep roots in the local communities. International events are also held here and the festivals attract talent and visitors from around the world. Sunday harvest festivals take place in the villages every month. Here, villagers share meals and join in a communal celebration. Harvest festivals were initially held as village thanksgivings for the previous year’s produce, and villagers invite people from neighboring villages to join in the ceremonies. A musical form of entertainment called cantata would be performed by the village choirs, followed by food and drink. This tradition is now celebrated as huge village cookouts. In the coastal villages, fishermen’s festivals are celebrated, usually on St. Peter’s Day, the patron saint of fishermen. These festivals start off with church services in the morning and then proceed to eating and celebrating way into the night. Tobago’s biggest fisherman festival happens at the Man-O’-War Bay at Charlotteville. Trinidad’s carnival is a euphoric event full of energy. In Tobago, on the other hand, the carnival season is more subdued and more focused on theatrical and folk elements. 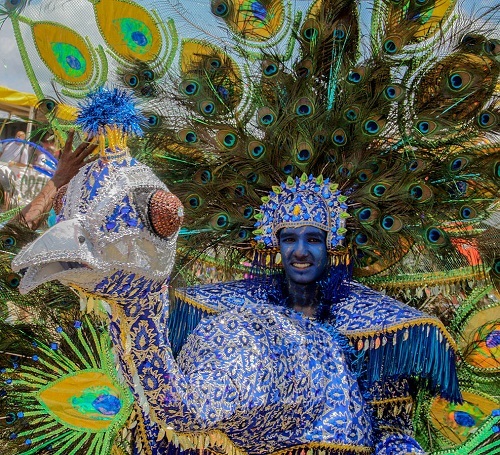 There are just as many events as those in Trinidad and Carnival is a blend of traditional and modern aspects. The Bago Carnival is full of color, delicious creole food and the sweet sounds of soca music. Tobagonians are extremely hospitable and visitors can interact with the bandleaders and visit the mas camps. The Bago Carnival does not have as many fetes and parties as the Trini one. It serves more as a place to cool one’s heels after the hectic partying season. It is usually known as the ‘last lap’ after Trinidad for those who want to calm down after the frenzy and activity of the Carnival. On Jouvay, or Carnival Monday morning, mud mas is the norm. The mud is believed to be therapeutic for the skin. This is followed by bathing in the sea. The costumed bands and masqueraders take to the streets on Monday, while Tuesday is the time for adults to parade in full costume. A uniquely Tobagonian tradition is the Goat and Crab Races. On Easter Tuesday, Family Day is held at Buccoo for these races. The tradition began 80 years ago as a response to the colonial class’ activity of horseracing in Trinidad. The goats are accompanied by barefoot ‘jockeys’ who run behind their goats holding them with long ropes. The event is first held from Easter Sunday to Tuesday, and then during the mid-year Heritage Festival. The festival mimics many elements from horse racing such as stables, live commentators and trainers. A track is specially built for the race. The goats are kept on special diets for months in advance in preparation for the race. The goats are encouraged to build stamina by swimming. In the crab race, jockeys guide the crabs using a short string, while also prodding them forward towards the checkered flag. April is the month of jazz in Tobago. Expats will have the opportunity to hear jazz on the beaches, in parks and in the bars and lounges. The Tobago Jazz Experience takes place in April and showcases some of the best local and regional acts, including world music. Previous events have attracted international artists such as John Legend, Chaka Khan, Stevie Wonder and Diana Ross, and many more. It is primarily a jazz event, but also features other genres such as chutney music, calypso and soca. The main venues for the event include Pigeon Point, Scarborough, Signal Hill and Speyside. In May and June, Tobago hosts a culinary festival where you can taste dishes from across the world, and especially local ones. Set against the picturesque Pigeon Point Heritage Park, the festival attracts Tobago’s best chefs who compete in a contest of their culinary skills. There is also a mixology competition, and a special wine zone which showcases international and local Tobagonian wines. The Tobago Underwater Carnival is a dive festival lasting for a week. Reef diving expeditions take place every day. There are also seminars and sessions on safety guidelines pertaining to the best diving practices. It takes place in North and South Tobago and is a chance to explore the richness of Tobago’s underwater world. The Tobago Heritage Festival is a yearly event aimed at preserving the culture and traditions of Tobago. It begins in mid July and continues till the start of August. It attracts throngs of visitors and is the main event on the Tobago cultural calendar. The Heritage Festival in Tobago is the equivalent of the Carnival in Trinidad. Visitors have the opportunity of visiting the many charming villages and getting a close look at their lifestyle, language and traditions. It was started in 1987 and in addition to being an occasion for entertainment, it is also a means by which communal customs and values can be passed on. Each village puts forth an event featuring the island’s customs. The festival moves from village to village every night and communities present local dances, music, food, storytelling and drama. The Carib Great Race is one of the major sporting events held in Tobago. It is a powerboat race that spans approximately 115 miles from the Gulf of Trinidad to Scarborough in Tobago. Trinis gather in throngs on the sister island to enjoy the race and participate in a party that follows on Pigeon Point Beach called the Great Fete. The race begins in the morning and the first few boats make it to Scarborough in about a couple of hours. This annual contest is considered to be among the most difficult offshore races and there are many tales of those who have partaken in this arduous test of endurance. Spectators can catch glimpses of the race as it continues along the Trinidad coastline. Have you lived in Trinidad & Tobago? What were your favourite activities? Share your thoughts in the comments below, or answer the questions here to be featured in an interview!